The cross (a hybrid) with one of its parents or with an individual genetically identical to one of its parents is called back cross. This cross is used to obtained inbred backcross lines. Inbred backcross lines (IBLs) in plant are lines (i.e. populations) of plants derived from the repeated backcrossing of a recombinant line with the wild type. It includes some kind of selection that can be phenotypical. Repeated back cross ultimately gives genetic pure lines. 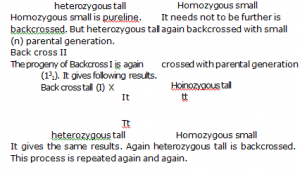 Mendel obtained heterozygous tall in F1 It was heterozygous or hybrid. Mendel wanted to obtain its pure lines. Therefore, he crossed these hybrids with one of the parental generation (P1). The progeny of Backcross I is again crossed with parental generation (PI ). It gives following results. All tall are obt.–;r-, . it means that pure line of that character has been obtained. It dos need further back crossed. This cross gives 50% homozygous tall and 50 % heterozygous tall. Both of these are again back crossed. One of its progeny will give pure line. Other will be hybrid. They are further back crossed. Each biek cross gives one pure line and one hybrid.